National Random Acts of Kindness Day is celebrated on February 17. However, kindness is a topic we all should be thinking about all year long. After all, February 12-17, 2017 is also Random Acts of Kindness Week (RAK Week). World Kindness Day is November 13, 2017, and RAK Friday is November 24, 2017 in place of Black Friday. For many people these days, I know it seems like kindness is hard to come by. With all the political disagreement and stress, it’s easy to lose track. It’s easy for us to remember to be kind sometimes…and it’s hard to try to fit in teaching our students how to be kind. 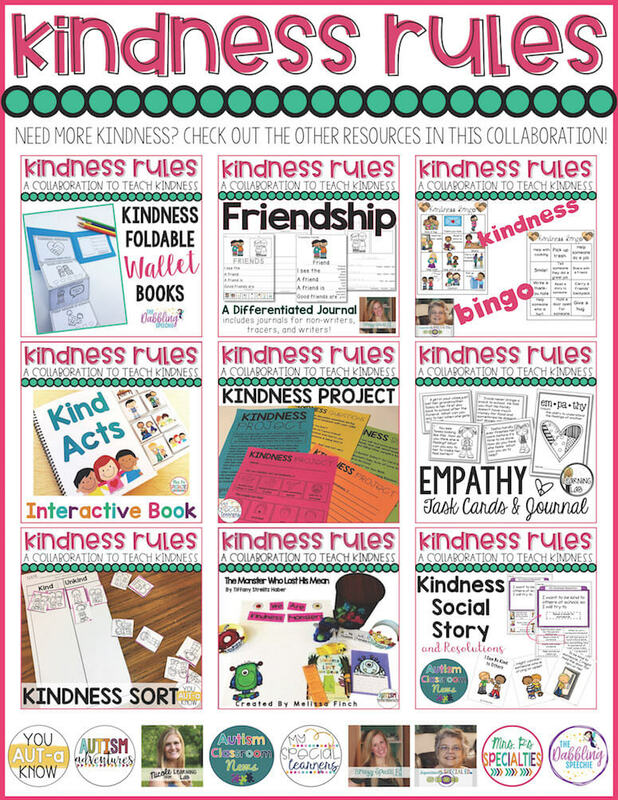 So a group of blogger / sellers and I wanted to take this opportunity to highlight ways to teach kindness in the classroom. To paraphrase from a Streetcar Named Desire, I rely heavily these days on the kindness of strangers. Kindness has a special meaning to me these days as I’ve been helping my mother who has a form of Parkinsons Disease. The kindness and thoughtfulness of the people who live in her facility as well as those who take care of them make the difference between a day when she feels good and a day when she despairs. And consequently it makes a difference for me the same way. We are fortunate that she is able to live in a nursing community that goes out of its way to be thoughtful and kind and it makes all the difference. All it takes is someone to stop and give her a hug, to make sure her hair is brushed, or to make sure she has the opportunity to listen to her music to make a huge difference in her day. Yes, taking care of my mother is their job….but they could do their job without stopping to take the time to listen to her, or take special care to make sure she gets the ice cream she likes. One of her most comforting things right now is a little stuffed animal that was left for her by a group of children who visited around Christmas time. It was a lesson of kindness for them and an act of kindness that meant much to her. Kindness is taking a moment or two to go out of our way to help someone out, share something nice, or just make someone smile. 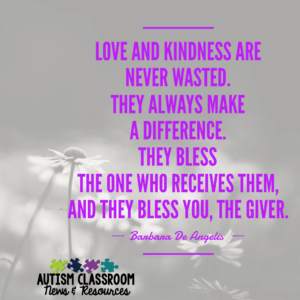 Although the most prized kindness doesn’t have an ulterior motive (i.e., I’ll do this for you if you do this for me), kindness offers something to both giver and receiver. Often when we do something kind, we get a smile or we just feel good knowing that we helped someone out. 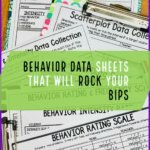 I’ve talked a lot on this blog about the need to teach the hidden curriculum and that the soft skills are the ones that make a difference in our students keeping a job. They also make a difference in living in a community. Being kind and thoughtful are behaviors that help make friends, make it more likely for people to help you when you are in need, and making human connections. Being kind also enriches their lives by opening them up to understanding others. It increases their self-confidence in being able to do something for someone else. It demonstrates their competence as well. Kindness is a pretty abstract concept and we know that our students are not that great at abstract many times. So, how do we make it more concrete without reducing it to an isolated act? There are many ways we teach it. Let’s face it, if we don’t set an example of kindness, no amount of teaching will help. We as educators set the tone of our educational community. We have to model kindness toward the students and towards other adults in the community. Or it could be as simple as writing positive notes to give to people around campus. Looking for ideas? Check out https://www.kindness.org/home to find ideas for all different ages and situations. Social stories are a great way to help our students with social difficulties to understand the why behind helping someone. It might be a simple social story about what kindness is, like the one offered as a freebie this week. Or it might be a social story that teaches broader implications of being kind to others. They are good ways to introduce the concept and also to share the perspectives of how others feel when you are kind to them. So, don’t worry–we have your back in teaching your students to be kind. 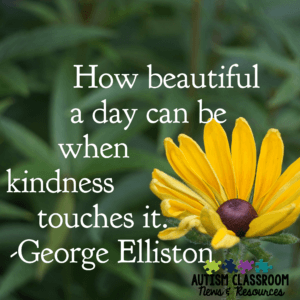 Eight other bloggers-sellers and I got together to try to think about how to make kindness more easily understood by our students. What emerged were 9 FREE products we worked together to create to help teachers of all types of students. 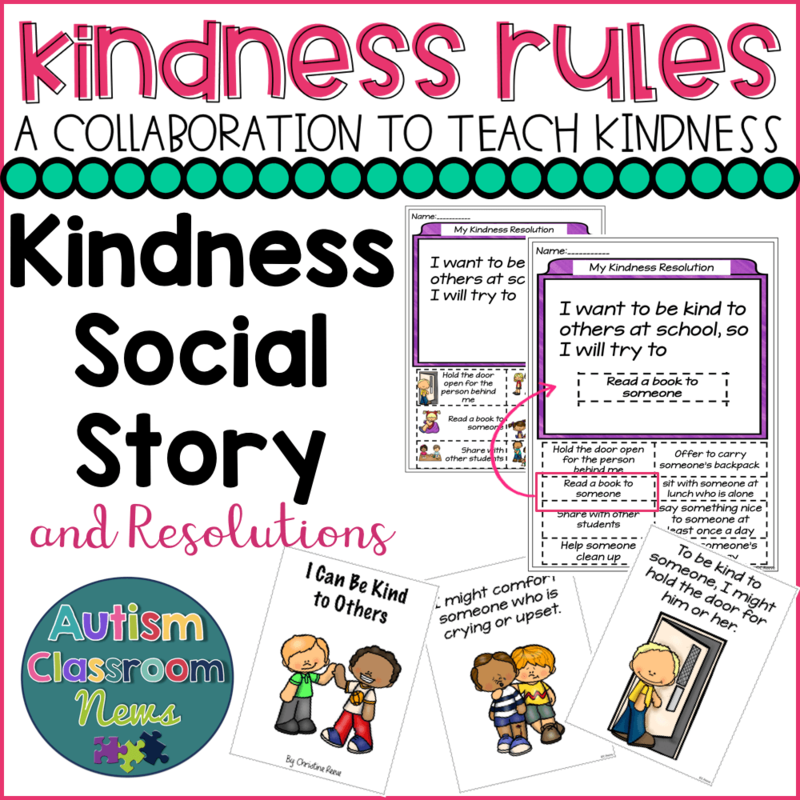 The products focus on everything from a social story and kindness resolutions (see below), to kindness sorts, kindness bingo, an interactive book, an adaption of a story, a kindness journal and a kindness challenge wallet. 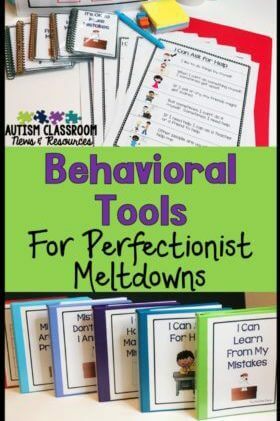 I’m so excited about what everyone created to touch on all the different facets of this lesson. And did I mention they are ALL free! I ncluded in this is a social story or introductory story about kindness. It talks about what it means and gives some specific examples of acts of kindness. 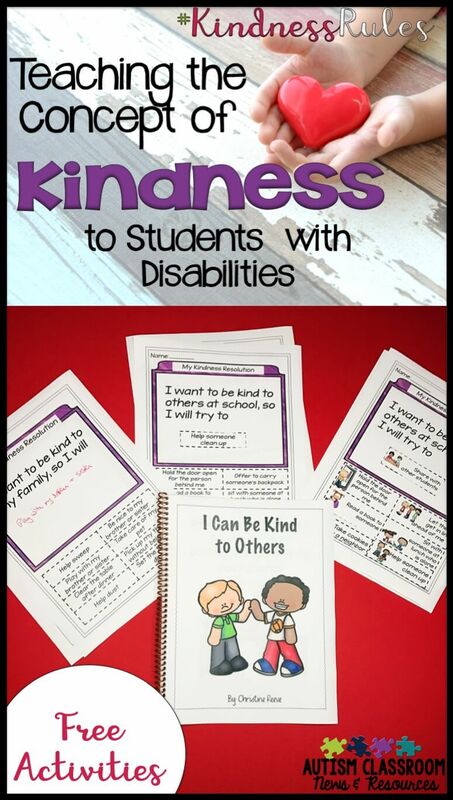 Then there are 3 pages (3 with pictures and 3 without) that are designed to help students resolve to show more acts of kindness in specific ways. If you have used my New Years’ Resolution freebie, it is similar to that. The student chooses one or more of the cut and paste kindness resolutions (with or without pictures). 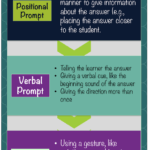 The students can cut out the resolution they choose and paste it in the sentence above. You could also cut these off and give them other choices they can paste. Students who can write could use the choices at the bottom as a word bank. Or you could cut these off and have them write without the cues. 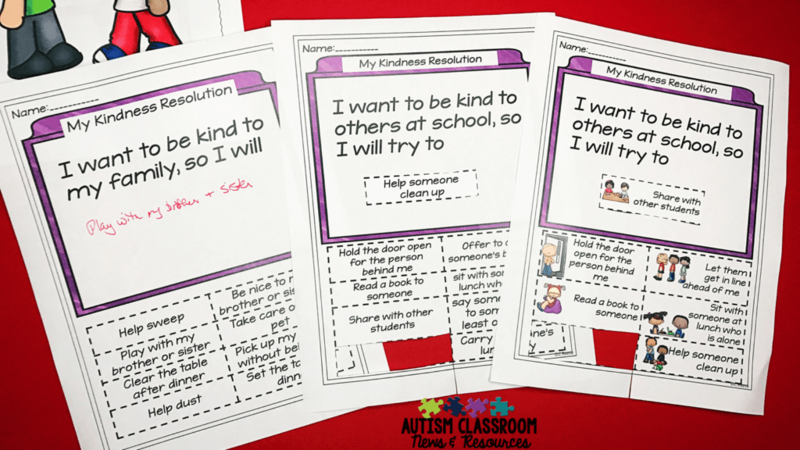 There is a page of resolutions for kind acts at school, one for home, and one for general (people I may not know). I started to make one for “strangers.” But I didn’t want to encourage some of our students to get involved with strangers without supervision. So I focused on more anonymous actions (e.g., donate to a food bank) and caring for friends. 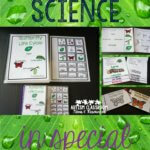 Hop over to my TPT Store and you can download it for free. 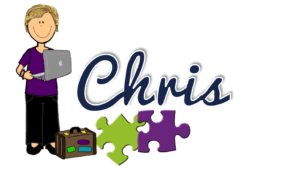 Then make sure to click the link in the product description (or the picture below) to see all 9 of the free activities you can download! These make great activities for Valentine’s Day this week too (and this one is a print and go–no laminating!). And I would LOVE to know how you are teaching and encouraging kindness in your classroom. Please share in the comments or on social media and tag me! And don’t forget on February 17 to do some Random Acts of Kindness.